Several students have told me a breeder or vet told them not to play tug with their dog because it would make them aggressive. Max and I usually play tug every night and he is not aggressive! If we walked for an hour or spent an hour at the dog park he is happy with a short game of tug. If he has a lot of energy to burn we get pretty wild and play “Super Dog” – that’s where we run around and he jumps up on the bed while tugging. I also played tug with my last dog, Buster Brown, and he was a 165-lb. Saint Bernard. He was not an aggressive dog either. Note: If your dog has any guarding issues you should work with him to resolve that behavior. See this post on Ahimsa Dog Training Blog – Resource Guarding http://ahimsadogtraining.com/blog/resource-guarding/ If you need help, find a force-free trainer who uses positive reinforcement. 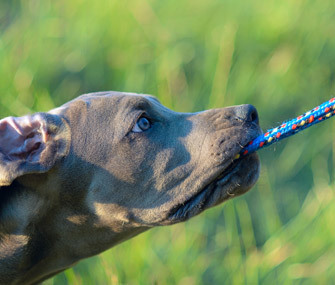 Playing tug can be a great way to bond, to burn off some energy, and help your dog learn impulse control. It all depends on how you play the game! Your dog should know “sit” and “drop it” first. Always ask your dog to sit before offering the toy. Use a toy that is long enough to keep your hand away from the dog’s mouth. We use a 3′ long rope braid. Some dogs growl when playing but I don’t think you should growl or act aggressively. Be a playmate – not an adversary. The game should be a joint effort to “get the prey”. Never lift the dog off the ground or jerk roughly – just use a rocking tugging motion. If your dog grabs your hand instead of the toy, just give a little yelp and drop the toy and walk away. Give him a minute to settle down and then start again. Ask your dog to drop the toy after tugging a bit. If he drops it, praise him and then tell him to “take it” again. Returning to play is the reward. If he refuses to drop it, ending the game is the punishment. Have fun playing and it is okay to let your dog win sometimes! Remember a tired dog is a good dog. Ruby and I play tug every afternoon. Gets rid of a bit of energy and it’s nice boning time. She usually gives up first! we have a small back yard! What is the concern with lifting the dog off the ground. Asking because sometimes, Donna leaps at the tugs at the toy so she will have her back legs on the ground but her fore legs in the air… her back and back legs are getting quite strong from the exercise!! It’s a nice information about best dog training.Thanks for this information .I really appreciate your work, keep it up.